Use this elegant set of Red Vanilla salad plates to add a classic touch to your dining table. These creamy white salad plates embossed dishes are ideal for parties and formal dining, but is durable enough for everyday use. I've had the mugs for some time. They hang on hooks over my stove and have a simple European charm. I decided to try out these small plates to use for breakfast with my mugs. I'm glad I did. Red Vanilla makes a nice product! I just purchased the Everytime White set because my dining room is more modern and The Tuscan Villa is more traditional. Both are beautiful for everyday or special occasions. I can't see how anyone wouldn't love either. 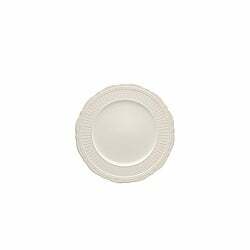 I love these plates the quality is very good and even better than I expected. I am only sorry that I did not order the extra bowls that complemented the set when I ordered the complete sets-- They are no longer available. I highly recommend this set for everyday or formal dinners. The old set we were replacing was dingy so the new set of dinnerware shines brilliantly in contrast.The whiteness of the plates really sets of the colorful food choices we enjoy. It makes the presentation just as delectable as the food; when food is an important part of your day, presentation is so important. Looks great, cleans up easily, presents well - what more can I say? These dishes were exactly what I was looking for and all arrived in good shape. I'm very pleased. We love these dishes. Simple enough to use everyday, yet elegant enough to use for a dinner party. Study and durable with a delicate feel. I recommend this dinnerware to anyone that wants a sturdy, nice looking set!